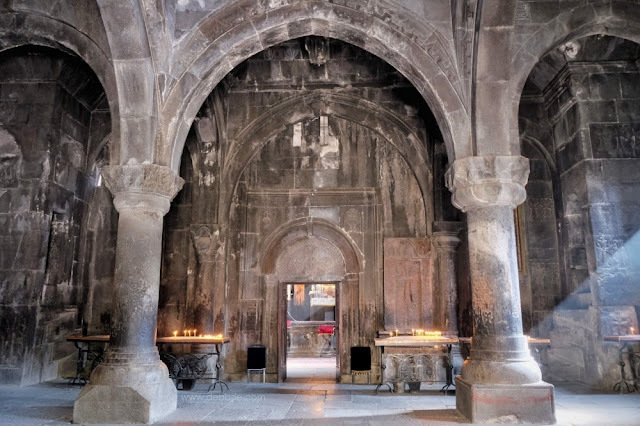 Armenia is truly a home of otherworldly churches and monasteries. 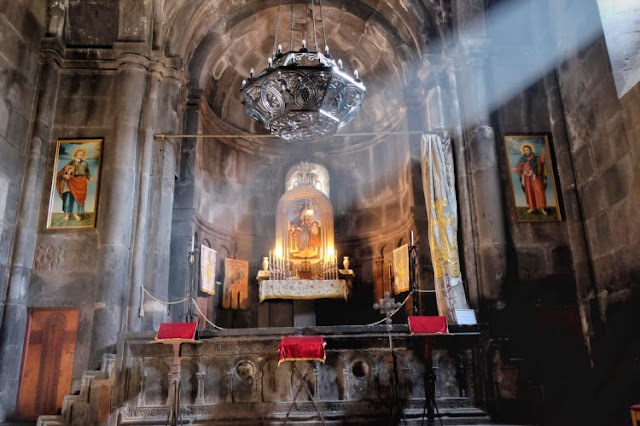 As I've said it before, I was blown away by the fact that Armenian are advanced in choosing the most dramatic and extravagant location to build their churches. 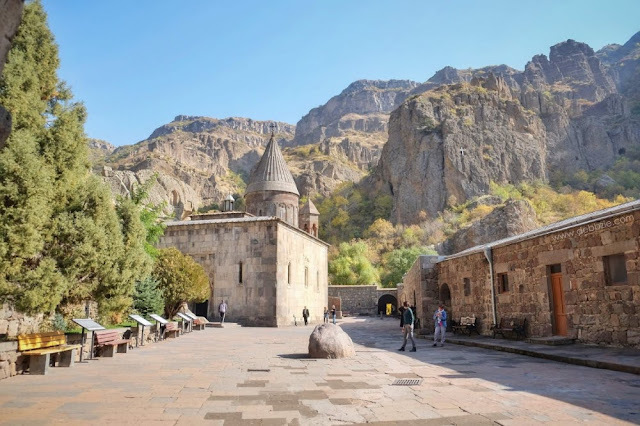 Previously I've posted about the gorgeous Noravank Monastery which is perched halfway up the mountain. Today I'm going to take you for another journey to my most favourite amongst all...*drum rolls*...the Geghard Monastery! 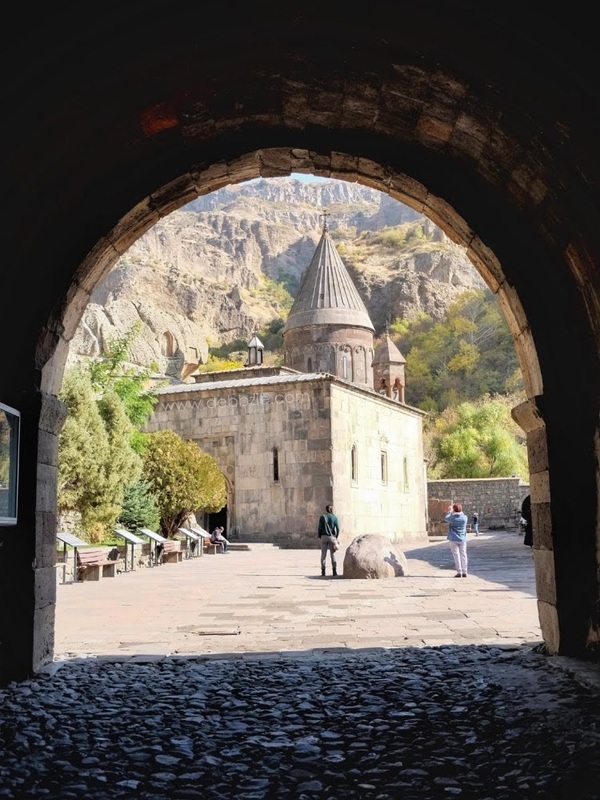 "The monastery of Geghard and the Upper Azat Valley contains a number of churches and tombs, most of them cut into the living rock, which illustrate Armenian medieval architecture at its highest point. The complex of medieval buildings is set into a landscape of great natural beauty, at the entrance to the Azat Valley. High cliffs from the northern side surround the complex while the defence wall encircles the rest." 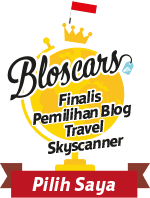 I peeked the brief introduction on UNESCO website before the trip and it already tickled my adventurous soul. I mean a rock-cut monastery complex? It can't be something as common as pancake with maple syrup, right? 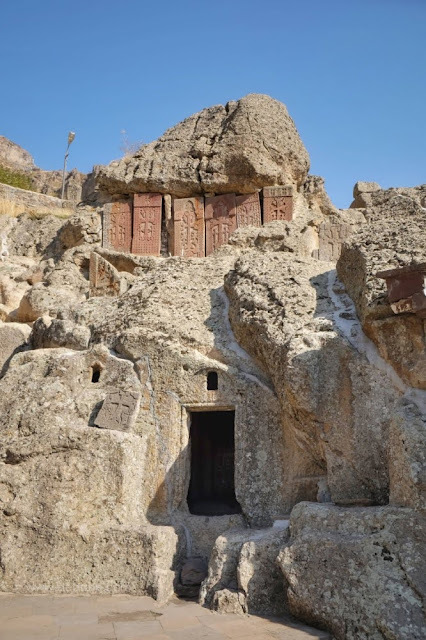 It was originally called Ayrivank, means monastery of the cave. The monastery was founded, according to tradition by St. Gregory the Illuminator, and was built following the adoption of Christianity as a state religion in Armenia (beginning of the 4th century AD). After a drive through winding roads into the heart of the mountain, Arman parked our sprinter van under the shade of a tree. I looked up as I jumped out the car but couldn't really see the monastery complex. From the parking lot, with anticipation high I made my walk up towards the entrance gate passing some Sujukh sellers (candle shaped candy made from fruits or nuts). As I get closer and the view of the monastery became clearer, my heart skip a bit. The greyish stone colour church stand tall ahead me encircled by tall cliffs with the first rock-cut church was built back in 1250. The setting is so dramatic, I could easily see it as a scene in some adventure movies like Indiana Jones or else. The autumn foliage made it look even prettier. Also I think I've made the best decision to explore the Caucasus countries in autumn. Not only the scenery was more beautiful, I also didn't meet any hordes of tourists at most places I visited. Moderately cool temperature was a plus too for a polar bear like me. My favourite part of this complex is the main church or called Katoghike and the Gavit, built completely against the mountain in 1215. Natural lights from outside were the only source of light beside the candles. I was there around noon, just in time to see the sunlight passed through the room from the windows. Highlighting the huge blackish grey columns and floors. Creating a very dramatic and Gothic ambiance inside the church. 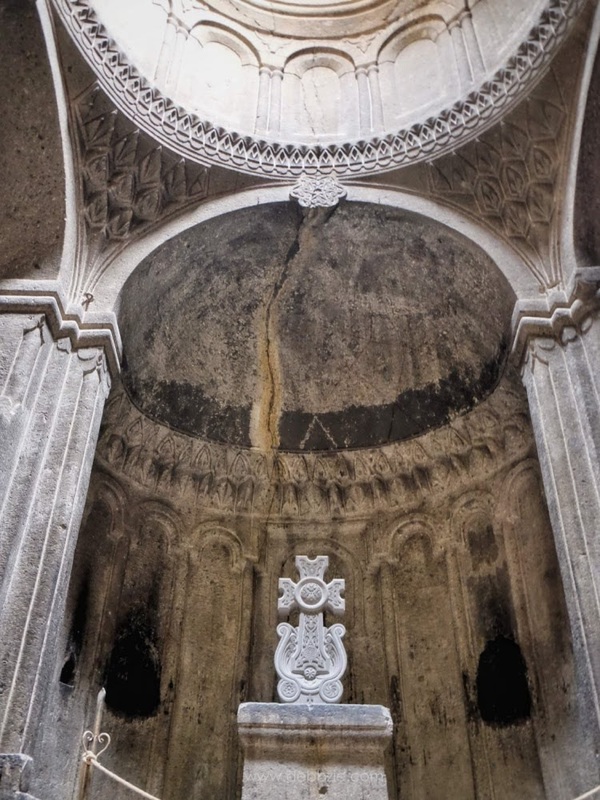 The carving on the wall, ceiling and cupola filled me with a sense of awe. I don't think I've seen any church interior as mind-blowing as this before. Mysterious yet captivating. Since the 13th century, the name was changed to Gedhardavank means Monastery of The Spear. 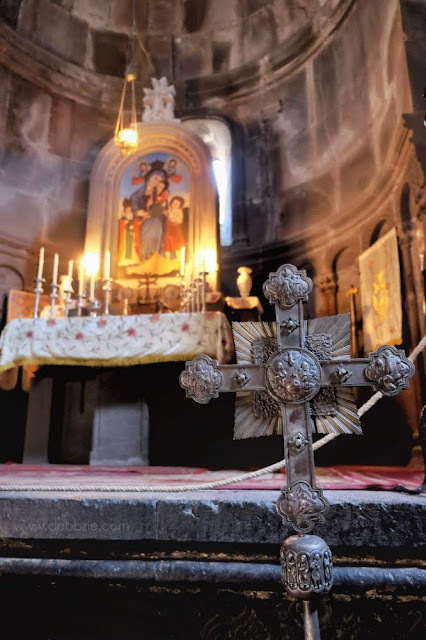 It was believed the spear used by a Roman soldier to pierce the crucified Christ was brought here by St. Jude (Thaddeus) the Apostle and was keep in this monastery for 500 years. 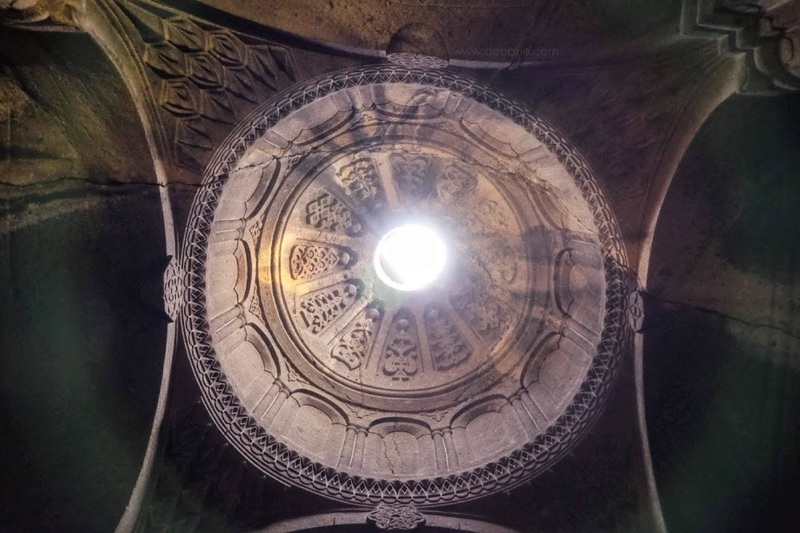 Currently the spear is exhibited at the Etchmiadzin Cathedral which is known as the oldest cathedral in the world. The Monastery of Geghard with its remarkable rock-cut churches and tombs is exceptionally well preserved and complete example of medieval Armenian monastic architecture and decorative art, with many innovatory features which had a profound influence on subsequent developments in the region. 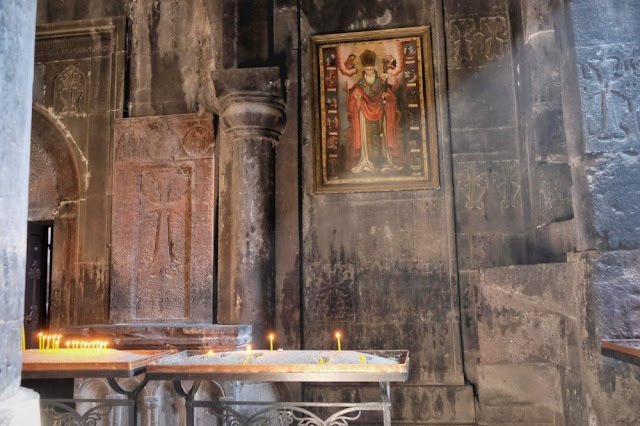 The Upper Gavit's acoustics are remarkable, perfect for Sharakan (Armenian religious chant), which sonorous notes drift across the room and seep into the adjoining areas of the monastery. Geghard was renowned as a musical school and was unique in having among its famous composers a woman, Sahakadukht, who composed and taught at the monastery in the 8th century. In those days women were forbidden to be seen by monks but Sahakadukht was so famous for her compositions that the Church allowed her to teach students at the monastery, hidden behind a curtain. Gayane my lovely local friend stood in the middle of the room and started to sing an Armenian song. I didn't understand what's the song about but her voice echoed really really beautifully that I got chills all over my body. She also told me that local choirs frequently come to Geghard Monastery to sing at the Gavit. Pilgrimages come here to drink the healing water from the holy spring that comes out from the rock under the north wall of the church. 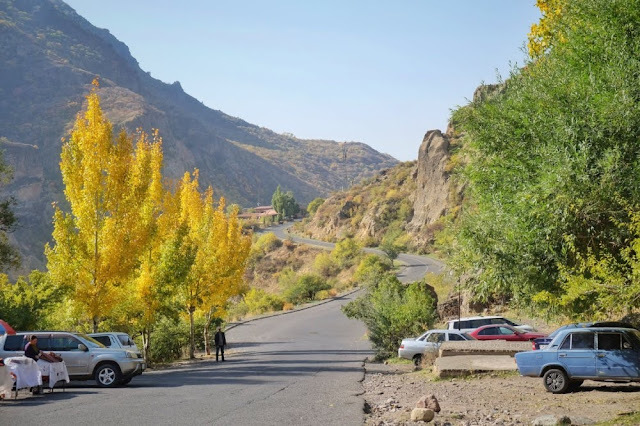 According to the locals, there was a legend about a sister and a brother from a noble family who decided to build a temple higher up the gorge of Azat River and live there. But, they couldn't figure out where's the exact place to build it. So they prayed everyday asking God to show them the way. They had been waiting for a sign until one morning they saw their scuffle hoe was stuck on top of the mountain. They thought it was the sign from God. The siblings then built the temple inside the rock with the help of a saint virgin and lived here till the end of their lives. Besides all the facts that's written in history, I always love to dig another twist of the story or the urban legend about a place. It makes me wondering, how did they get into the idea? Or is it actually what happened back then? Perhaps because I grew up listening to tons of Indonesian urban legends as my bedtime story. As I get older I realised most of them are just a myth but it still fascinates me. How about you? 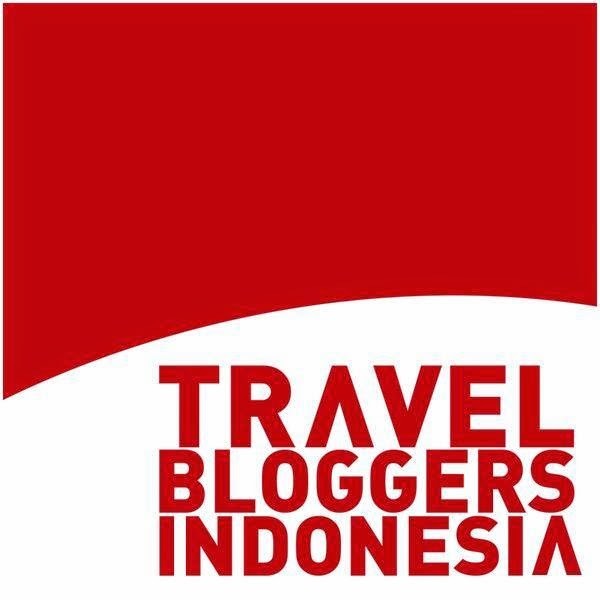 Do you also love to seek some urban legends when you travel ? 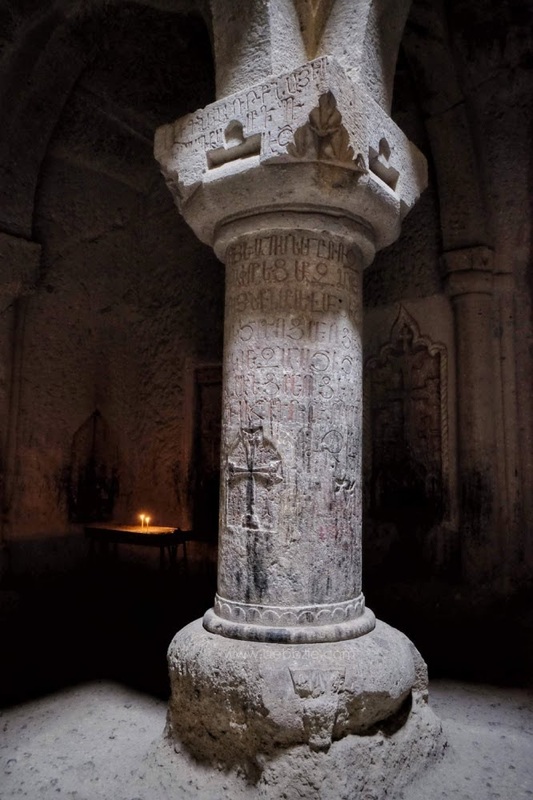 * Geghard Monastery is about 40 km away from Yerevan. 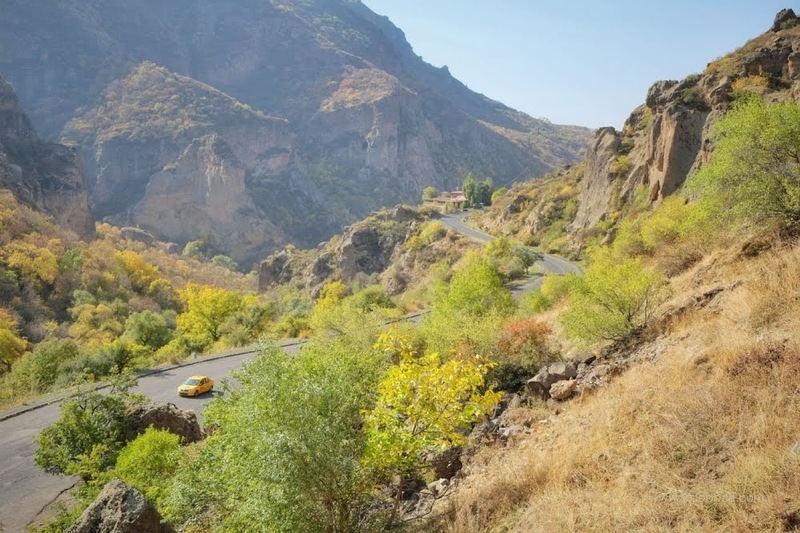 You can do it as a day tour and combine it with a visit to Temple of Garni which is only 10 km away, like I did. * I can't say much about taking public transportation but I think you can take marshrutkas or local minibus from Yerevan. The easiest way to reach Geghard is either by hiring a private car or taxi like I did, or join a day tour which can be organised by most travel agents in Yerevan. 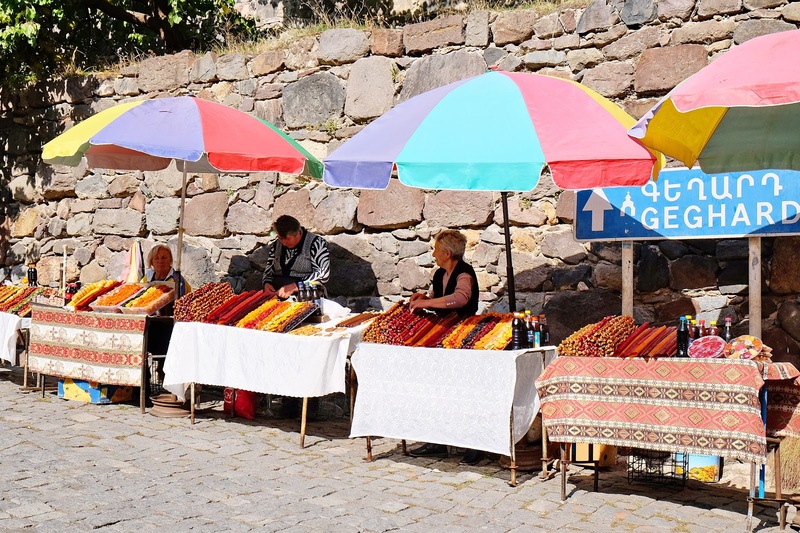 * Thankfully I loaded up my backpack with some snacks and water that I bought from Yerevan. Because I've seen only a few shops along the way. * I explored Armenia in October 2017 and there was no entrance fee at Geghard Monastery and all other churches or monasteries that I visited. I am not a religious person but I adore the architecture of churches and monasteries. The detailing on the ceiling, the engraved crosses and the carving of the lions are fabulous. It must have taken a long time to do that. 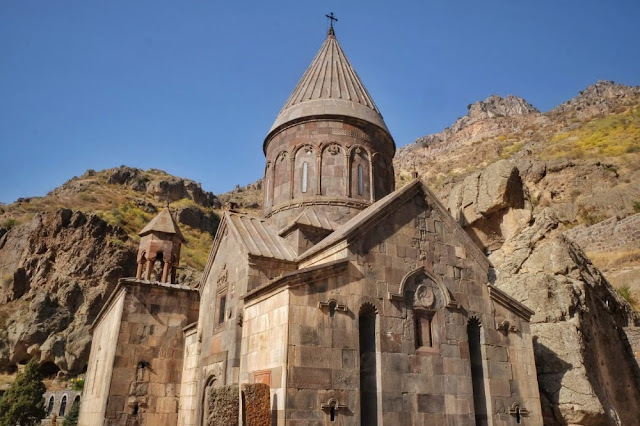 I love ancient church and monasteries too! 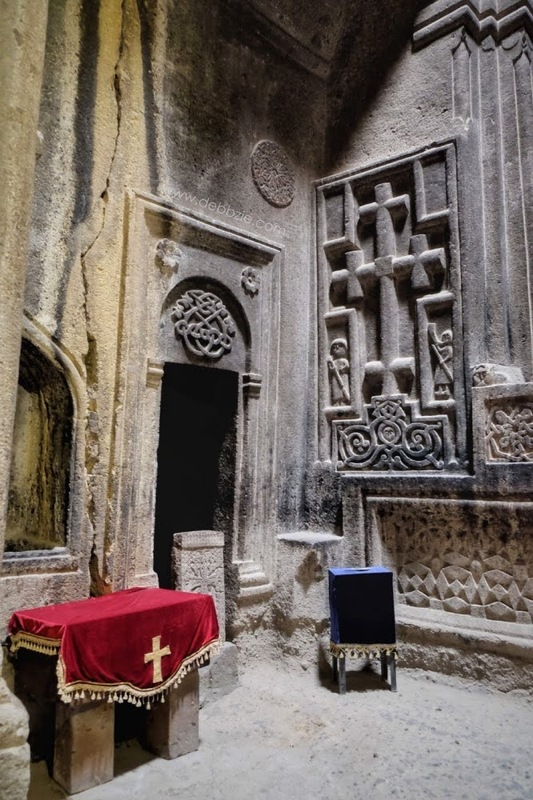 Geghard Monastery is a church perfectly cut into the rock and built from rock. It looks so solid and uncrushable (if there is such a word). 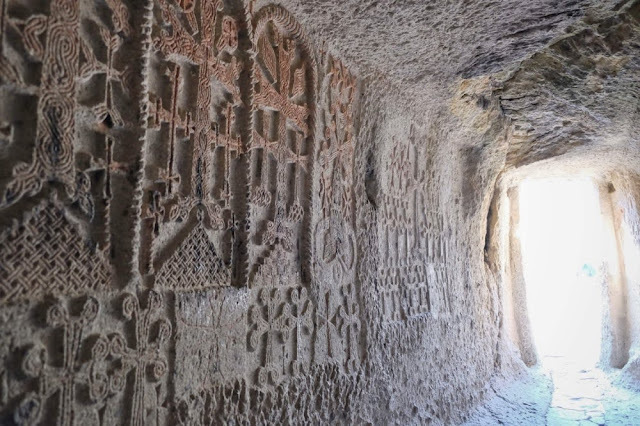 Built in 1250, the details, the engravings, the carvings as well as the over-all structure, should indeed be preserved as a World Historic Site. There is something about rock-cut monolithic structures, which awes me. I always wonder how, in the absence of modern tools, people would have visualized, and sculpted outside-in. This one is just beautiful beyond words. 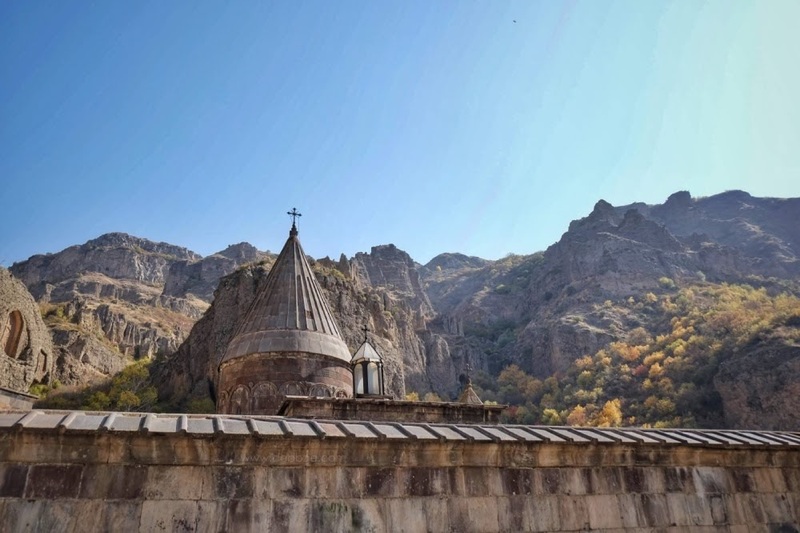 Since I live in Dubai, Armenia is not too far off and I've long been considering a weekend getaway to this country. 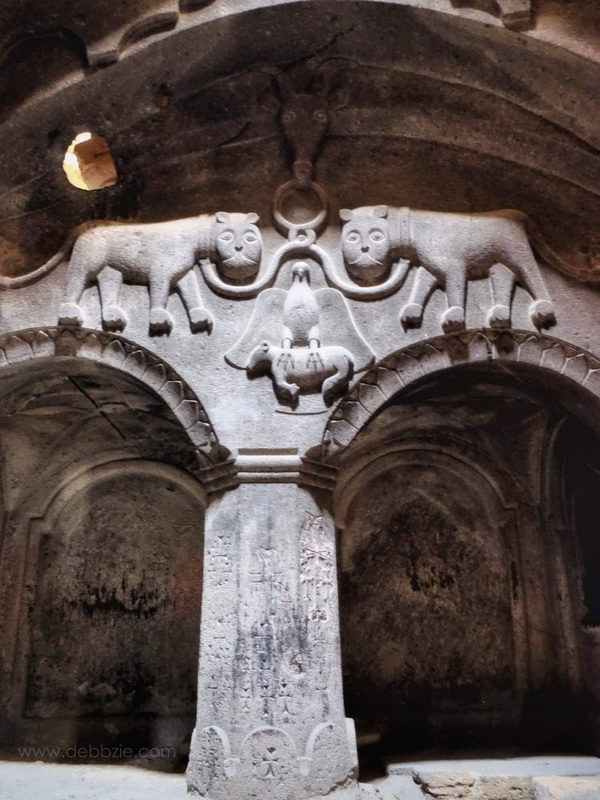 Geghard Monastery is one place I always come across whenever I am researching the perfect itinerary for a long weekend and I am not surprised, it looks pretty awesome! Not surprising at all, the architecture seems very similar to some of the monasteries that I saw on my trip to Georgia last year. I find urban legends more entertaining that based in reality. What's fascinating to me is what the stories convey. The sense of what past generations valued and found important. 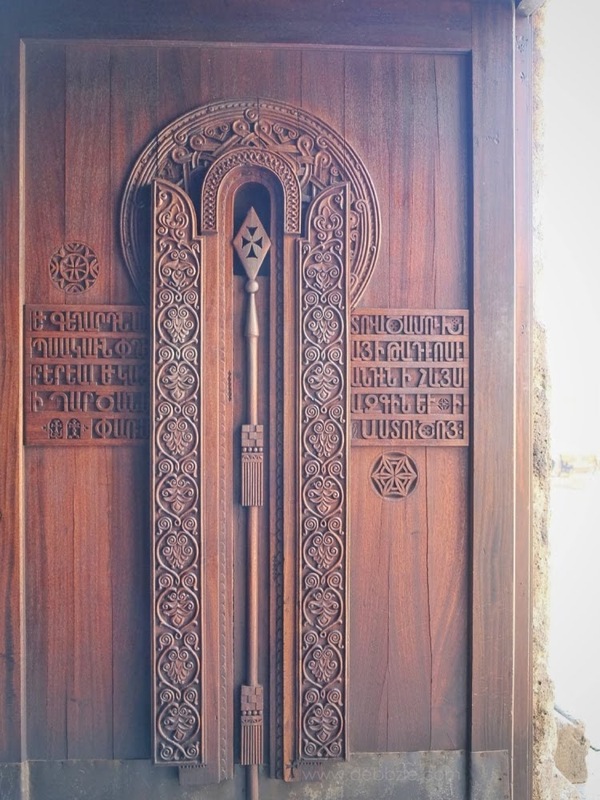 The architecture is quite stunning and the intricate doors and carvings are remarkable. What a interesting article. This Monastery looks amazing! I love visiting historical places like this. The history of something so old is fascinating. So nice that your friend sang for you so that you could experience that.I bet it sounded great! Your pictures help me to get an idea of what it was like, but I bet it is so much better in person. 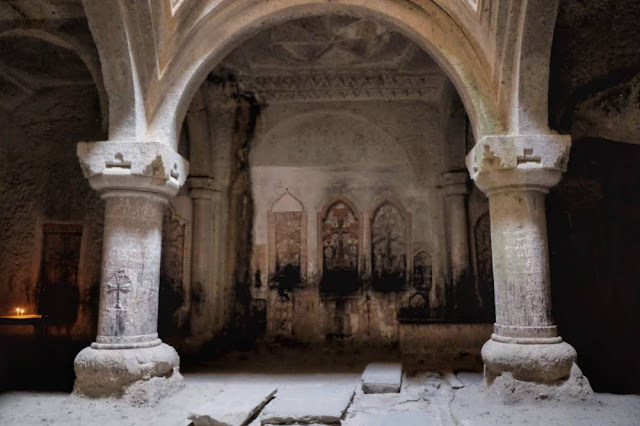 The Geghard Monastery looks like something straight out of a fairytale or Knights of the Roundtable! I don't know if I've ever seen anything as historic as this sight especially given the claims around the spear kept within. Looks like a great place. i can imagine it being a bit of a pain to get to if you do not have your own transport. The architecture looks amazing and to think they are hand made carvings!?! 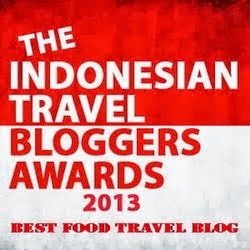 and yes, if i visit i will bring food with me! 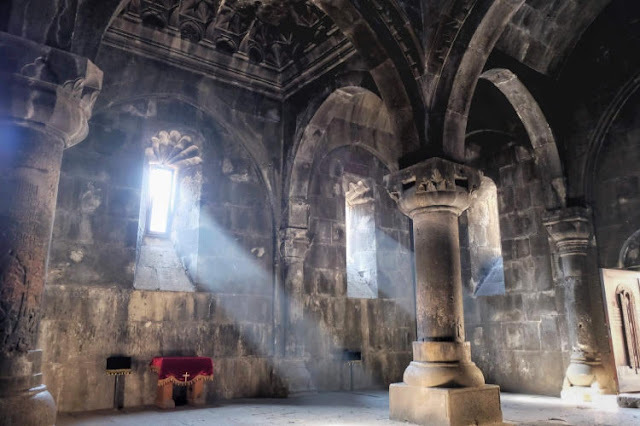 Deb, looking at those photos of the monastery really makes me want to go to Armenia now (the thing is I always want to go to a place beautifully described and photographed by fellow bloggers, therefore the list keeps growing!). The weather seemed to be very pleasant, and that ray of light going through the monastery's centuries-old windows, simply magical!